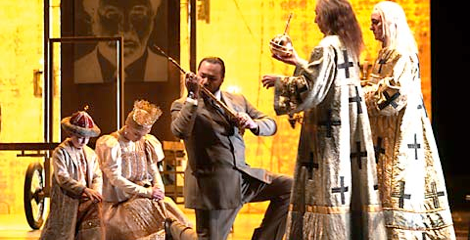 The Canadian Opera Company's "Boris Godunov" is magnificent. The singers, orchestra, direction and design combine to prove yet again that Mussorgsky's operatic masterpiece is still one of the greatest operas ever to treat its historical subject matter seriously. Mussorgsky based his own libretto on Alexander Pushkin's play of 1826 the same name. Pushkin modelled his portrayal of events in early 17th-century Russia after Shakespeare's history plays. As in Shakespeare the story is a dual tragedy of both ruler and ruled. Like Richard III or King John, Boris has murdered a child, here Dmitry, the youngest son of Ivan the Terrible and rightful heir to the throne. As in Shakespeare nature reacts to this usurpation, in this case through famine and the people's rebellion. Like Shakespeare's usurpers Macbeth or Henry IV, Boris is consumed with guilt and never can enjoy the crown he strove for. The twist to this model is the rise not of a Malcolm or a Richmond but of a pretender to the crown. The young monk Grigory, learning from the chronicler Pimen of the confusion surrounding Dmitry's demise, decides to pose as Dmitry himself. Backed by the people and the nobles, the false Dmitry claims the throne. The tragedy for the Russian people is to have one false ruler replace another. How the story actually plays out depends on which of Mussorgsky's two versions is presented. The COC has chosen a dramatically satisfying composite of the two. It has used the original 1869 version which omits the so-called "Polish Act", a colourful interlude but unnecessary for the forward movement of the drama. The opera ends not with the death of Boris as in the 1869 version but with the Kromy Forest Scene of 1872 that places Boris's death in the context of the suffering of the Russian people and thus by echoing the work's opening, gives the work a circular structure. The production, borrowed from the English National Opera, won the 1998 Olivier Award for best opera production and it's easy to see why. Designers Hildegard Bechtler (sets) and Nicky Gillibrand (costumes) have shifted the action forward to the 20th century to reflect the continuing repetitions of repression of the Russian people under tsars and dictators. A blank grey wall on stage throughout the action. Only those in power, not the people have access to what lies behind it. Alan Burrett's lighting makes frequent contrasts between the warm glow of religious scenes backed by a huge iconostasis and the bleak cold of the outdoor scenes. Director and choreographer Denni Sayers has recreated original director Francesca Zambello's production with some minor changes, most notably in Shchelkalov's more dramatic manner of murdering Boris's son Feodor. Zambello via Sayers has clearly placed the emphasis on the people so that often when Boris is on stage with them he is swallowed up in the crowd. Sayers' other hat as choreographer shows in the efficiency with which she moves the huge COC chorus around the stage and in the great dramatic impact they made. I happened to see the ENO production in 1998. With new personnel but with the same staging, the COC version has nothing to fear by comparison and in many ways is superior. To have the work sung in Russian (instead of English) is a major gain since it helps preserve the dark, sometimes harsh sound-world Mussorgsky's music creates. The 69-member COC chorus, as prepared by Sandra Horst, reigns supreme. Not only is their singing glorious but they heighten the realism by providing the "people" with individualized characterizations. Bass-baritone Gidon Saks used his large, powerful voice to give nuance to Boris's descent from fear into madness. Such is the sensitivity of his singing and acting that it is hard not to feel compassion for a tyrant who himself becomes prey to others. American Jay Hunter Morris's tenor is weighty enough to make his Grigory/Dmitry a worthy antagonist to Saks's Boris. In the scene in Pimen's cell, he changes from a seeming innocent to a scheming opportunist right before our eyes. The night I attended Kevin Langan was so at home in the role as the aged monk Pimen one would never have suspected he had arrived in Toronto just three hours earlier to substitute for an ailing Gustáv Belácek. He endowed the role with the perfect mixture of modesty and authority to make Pimen a marker against which to measure Boris's madness and Grigory's deceit. The other marker is the Holy Simpleton, a helpless observer of the action, sung and acted so affectingly by Benoit Boutet in one of his best-ever performances. There are no weak links in the cast. Pure-toned Shannon Mercer made Xenia's one big aria more urgent and heartfelt than I have heard before. Robert Pomakov and David Pomeroy as Varlaam and Missail and Sonya Gosse as the Hostess bring a welcome of sense of comedy to the work in their well-sung, folk-inspired songs in the tavern scene. Tenor Vadim Zaplechny, seen earlier this season in the Puccini/Mascagni double-bill, is much more at home as the sinister Prince Shuisky. The smaller roles are all well played and sung by Thomas Goertz (Nikitich/Jesuit), Olivier Laquerre (Shchelkalov), Bruce Schaef (Khrushchov), Colleen Skull (Xenia's nurse) and the ever-reliable Cornelis Opthof (Mitiukha/Jesuit). Conductor Richard Bradshaw drives the music forward and brings out the chiaroscuro of Mussorgsky's original orchestration that makes, for example, the spectacular coronation scene seem as ominous as triumphant. Like the production Bradshaw and the entire ensemble capture the nightmarish feel of events hurtling irresistibly to tragedy. Photo: Gidon Saks as Boris Godunov (centre). ©2002 COC.